Spending a week within the Arctic Circle on this very special 16-night cruise will present you with a host of remarkable sights and experiences, discovered during magical scenic cruising and time ashore in fascinating destinations. A two-day exploration of Spitsbergen – situated just 700 nautical miles from the North Pole – is sure to be the highlight, with visits to Longyearbyen and Pyramiden making for a unique experience. These beautifully isolated towns boasts stunning Arctic scenery and offer a fascinating insight into the Soviet influence on this remote region; look out for typically Soviet-era architecture and abandoned mines presenting a glimpse of Spitsbergen rich industrial heritage. Longyearbyen is also your gateway to the rugged Arctic wilderness of the Longyear Valley, uncovered on a trek of exhilarating dog sledding adventure. 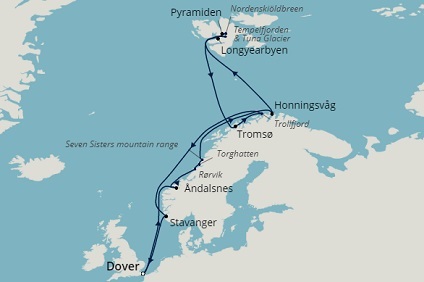 Your time in Svalbard will also include memorable sails by the magnificent Nordenskiöldbreen and Tuna glaciers, as well as the jaw-dropping stratifications of Tempelfjorden’s Temple Mountain. Surrounded by the incredible mountains of the Romsdalsfjord, Åndalsnes is often referred to as The Alp town by the fjord. Situated at the mouth of the Rauma River, Åndalsnes in one of the most beautiful areas of scenic Norway. The town is a natural start point for forest walks in the hilly terrain and short hikes to magnificent viewpoints. With all its natural attractions –this beautiful destination is one of Norway’s most popular locations for sightseers. This 'Mountaineering Capital' is a mecca for hikers, and the Trollveggen (The Troll Wall) – the tallest vertical rock face in Europe – is an appealing challenge for many climbers. Many visitors, who wish to enjoy the sights of Åndalsnes without the effort, can take the Rauma Railway into the mountains to discover amazing views. Generally regarded as the northernmost town in the world at 78° north, Longyearbyen, is the largest settlement in the stunning Svalbard archipelago. Located deep in the incredible Norwegian Arctic wilderness on Spitsbergen, it is the largest of the Svalbard islands. Set at the end of the Advent Fjord, and framed by flat-topped, snow-covered peaks, Longyearbyen is home to some 2000 inhabitants, several reindeer and the odd polar bear. The town Longyearbyen was only established as a permanent settlement in 1906 to exploit local coal reserves, and is named after American mining specialist, John M. Longyear.